E-mail written 10 Jun 2012 to Warren Culpepper from Teresa T. Roberts (gd/o #7068), e-mail address. Rose Howell Culpeper (2-p), Duval Co., FL, White, 19 Apr 1884 - 04 Dec 1975. Erline Culpepper, Daughter, F, 3 1/12, Sng, FL/GA/GA. Christine Culpepper, Daughter, F, 1 2/12, Sng, FL/GA/GA. Susie M. Culpepper, Hillsborough Co., FL, White, 21 Mar 1906 - 24 Feb 1970. Joseph Culpepper, Son, M, 12, Sng, FL/GA/GA. Find A Grave Memorial# 62027301. E-mail written Jul 2016 to Lew Griffin from Theda (Culpepper) Erikson, e-mail address. Lela Culpepper, 21 Nov 1901 - Jun 1987, Sarasota, Sarasota Co., FL; SSN 262-10-9378 issued in Florida before 1951. Benjamin Franklin Culpepper Jr., Manatee Co., FL, Male, White, Vol 1244, Cert 6296, died 1947. Benjamin F. Culpepper, 1929 - 1947. Obituary of Virginia Ann Culpepper (#63329), published April 23, 2012. E-mail written 8 Apr 2013 to Warren Culpepper from Jeffrey Harold Culpepper (#64105), e-mail address. Greenwood Cemetery, Panama City, Bay County, Florida. At the intersection of Lisenby Ave. & 17th Street. + Edward David Culpepper, Sep 15 1927 - Nov 11 1997, MSGT US Air Force, Korea. Biography* � They married December 19, 1941 in Geneva, Florida at Sieg's log cabin, Buck Lake. Vernon M. Culpepper, Son, M, W, 10, Sng, FL/FL/GA. The 1930 census record age was for Vernon was transcribed in error. It is actually "3 9/12." + Carroll W. Culpepper, 23 Oct 1888 - 25 Nov 1934. Margaret Mae Culpepper and Henry Anderson Wolcott married in 1941 in Seminole Co., FL. Henry Anderson Wolcott, 67, White, born 27 Jun 1915, died 18 Feb 1983 in Orange Co., FL. Khadra Ann Culpepper Ward, Siegs in Eight Generations, Winter Park, Florida: Ward, 1976, Repository: LDS Family History Library - Salt Lake City, Call No. 929.273 Si15b. Obituary* 28 Jul 1992� Cocoa - John Neal Culpepper Sr., 67, a coordinator for McDonnell Douglas in Titusville, died Sunday, July 26, at Wuesthoff Hospital in Rockledge. Mr. Culpepper was born in Sanford. He came to Brevard County 40 years ago from Geneva. He was a Navy veteran of World War II and a member of the MacDac Bass Club. Survivors include his wife, Marian Culpepper of Cocoa; sons John Culpepper Jr., of Merritt Island and Bob Packard and Charles Packard, both of Rockledge; daughter, Susan Manning of Lutz; sisters, Margaret Wolcott of Oviedo and Khadra Ward of geneva; brothers, Carroll Culpepper of Panama City and Vernon Culpepper of San Antoniol and 13 grandchildren. John Neal Culpepper, Cert 80603, Brevard Co., FL, White, 03 Aug 1924 - 26 Jul 1992. Obituary of John Neal Culpepper Sr. (#51563), published 26 Jul 1992 in an unknown newspaper and provided by Linda Crompton. Vernon Mercer Culpepper, died 11 Jun 2000 in Bexar Co., TX. Jeffrey P Culpepper, Male, died 5 Sep 1998 in Bexar Co., TX. Zella Moody Culpepper, Duval Co., FL, White, 18 Jul 1897 - 31 Jul 1971. Cincinnatus T. Culpepper, Head, M, 56, Md, FL/GA/GA, M.D. Vivian Fretwell, Boarder, F, 24, Wid, GA/GA/GA, Bookkeeper/Abstract Co.
John Ivar Culpepper, Grandson, M, 9, Sng, FL/FL/FL. John I. Culpepper, White, d. 19 Oct 1956 at 60 years in Chatham Co., GA; Res. in Chatham Co., GA, Cert # 22998. (From the Wings Across America notebook: We were blessed to spend time with Carolyn at her home in Cocoa Beach in April of 2003. Her early memories include going on house calls with her grandfather, who was the first doctor in Taylor County, Florida. Later in life, she was involved with doctors again, this time as the only woman on the 12 member Board of Directors for the Cape Canaveral Hospital. Guess who was in charge? Her 6,000 volunteer hours and her time on the Board were important to Carolyn. She was part of the 'Battle of Banana River' --making sure the hospital could expand and continue to serve the growing community. 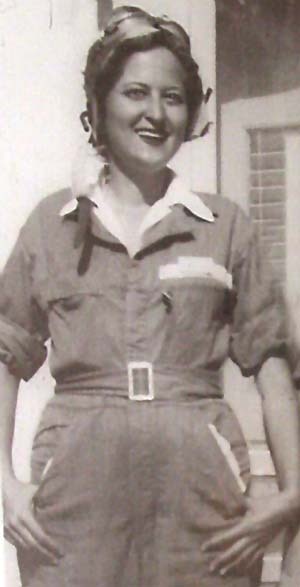 As one of a select few of WASP [Women Airforce Service Pilots] who married "Navy Pilots," Carolyn lived the life of a military wife in Sumatra and Indonesia. The move back 'home' to Florida came when her husband took charge of establishing Weather Service stations all down the west coast of Florida for the military. Carolyn took us to lunch at a local cafe where she had been going since the late '40's. Everyone knew her. Everyone. Carolyn C. Miller (Thames), 86, of Cocoa Beach, FL, died Friday, October 7, 2005, at home. Carolyn was born in Perry, Florida and came to Cocoa Beach in 1950. She served on the Board of Trustees at Cape Canaveral Hospital for 31 years and was active as a hospital auxiliary. She graduated from Florida State Teachers College (FSU) and subsebuently went to Avenger Field, Sweetwater, Tx. during World War II where she earned her wings as a WASP [Women Airforce Service Pilot]. She was eventually stationed at Randolph AFB, San Antonio as one of 11 women certified as an Air Force multi engine instructor. She remained an active member of the WASP Organization. For more than two decades her passion was raising and showing Yorkshire Terriers including several Champions. She was an active member of the Community Church of Cocoa Beach, the Business Improvement Council of Cocoa Beach, the Cocoa Beach Citizens Academy, a past president of the Cocoa Beach Womens Golf Association, and a Director of the Cocoa Beach Citizens League. Carolyn was preceded in death by her husbands, L. L. (Bubber) Miller and James Thames and sons, James Grimes and John Michael Thames. She is survived by her daughter, Jacque T. Crawford and husband, Tom of Delray Beach; step-son, Larry Miller and family of Big Canoe, GA; grandsons, Jansen Thames of Cocoa Beach and Mark Crawford of Lake Placid, NY; and four great-grandchildren. Carolyn has requested no flowers, and asked that memorials be made to the Cocoa Beach Community Church, 126 South Atlantic Avenue, Cocoa Beach, FL 32931 or Hospice of Health First, 1900 Dairy Road, West Melbourne, FL 32904 or to the Humane Society of Central Brevard, 1020 Cox Road, Cocoa, FL 32926. Calling hours will be held from 5 to 7 p.m. Monday, October 10, 2005, at Beckman Williamson Funeral Home in Cocoa Beach. A Memorial Service will be held at 4 p.m. Tuesday, beside her mausoleum at Florida Memorial Gardens in Rockledge. E-mail written March 2008 to Warren Culpepper from Jacque Crawford (d/o #51566), e-mail address. Carolyne Culpepper, Boarder, F, 12, Sng, FL/FL/FL. E-mail written 21 Jul 2011 to Warren L. Culpepper from Betty Jean Culpepper Pitts (#62573), e-mail address. He graduated from the University of Florida with a Bachelor of Science in building construction with honors and was a member of Alpha Tau Omega fraternity. He then graduated from the University of Florida with a Master of Science in business administration and now owns and operates his construction company, Black Diamond Development (July 2011). Loys Emerson Culpepper, Jefferson Co., FL, White, Male, died Nov 1964. Frank Culpepper, Alachua Co., FL, Female, White, Vol 931, Cert 2742, died 1941. Mable Marion Maxwel Culpepper, Cert 77828, Alachua Co., FL, White, 20 Mar 1918 - 01 Jul 1994. W. F. Culpepper, Alachua Co., FL, Female, White, Vol 1099, Cert ? ?, died 1944.